I often write about the energizing effect of being outdoors and how vibrant the scenery looks when one is running or riding. This commission is a gift for an avid cyclist – so avid that she has, in fact, a tattoo depicting a stylized peloton of cyclists. That was my starting point when envisioning this scene. I also thought about the euphoria you feel when you’re outside and moving. To me, that means a visual balance of relaxation and action: clear uninterrupted areas of color (sky, water) alternated with areas of detail (city, industry). Anyone living in Vancouver knows how, after the long dark and dank period of December and January rain, an unexpected burst of spring is cause for celebration! 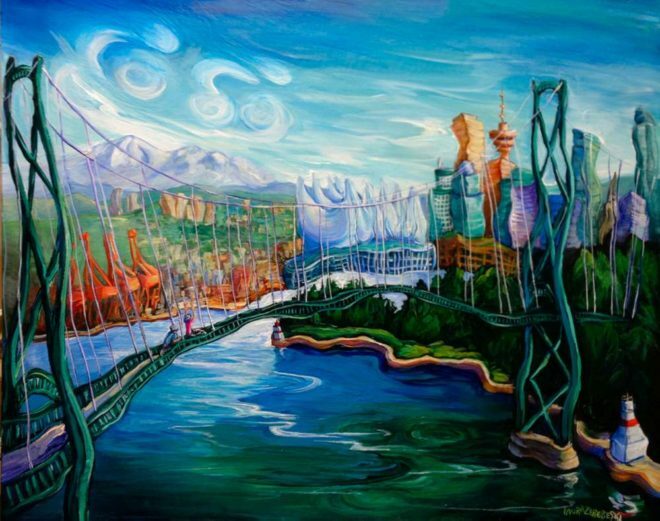 Thus, the scene looks through the Lion’s Gate Bridge to Vancouver with the “eye path” moving from the widest and closest part of the bridge across the canvas and along the seawall to see what’s around the bend. That’s the journey narrative. What was particularly important for me to capture was the “tightrope” effect of speeding over the bridge and being aware of everything around you – the sun, the city, the exclamation points of the lighthouses on the seawall, and every bump you feel when you’re coasting down a narrow path. The breezy clouds are a nod to the recipient’s peloton tattoo. See how the cloudy peloton is positioned speeding downhill? That’s because there’s nothing like the feeling of having the wind pushing you along and making pedaling easier as you zip from one bridge tower to another. There’s also a subtle reflection of the same peloton shape in the water down below. Then there are the cranes, the city, and the rare and awesome sight of Mount Baker on a crystal clear day when it rises from the horizon like a mirage over the layers of hills. If you look closely, there are two small cyclists on the bridge: one in aquamarine and one ahead in magenta with raised arms. These two cyclists are the only human elements I included in this scene because when you’re outside on days like this, you feel like you own it all.